Our customers love our products, and we love our customers! But getting out to the farm to pick up your pasture raised meats isn't always easy. Introducing Pick Up Locations - JSK Pasture Raised Meats Delivered To Your Neighborhood! Order online and select a pick up location near you. We deliver to our pick up locations every 4 weeks. Don't see one in your neighborhood, host one and save money on your order! For more information on How Pick Up Locations work, click here. 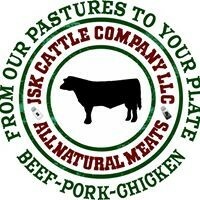 Starting this week, we are offering Affordable Home Deliveries - JSK Pasture Raised Meats Delivered To Your Door! Order online by midnight on Monday and we will deliver your order to your door either Wednesday or Thursday for a flat $10 fee. For more information on How Home Deliveries Work, click here. Of course you are still welcome to shop our onsite Farm Store or place an order online for pick up at the Farm Store. Did you know that when you create a new online account, you will save $5 off your first online order? And when you refer a friend, you will get a $5 credit when your friend places their first order. There is a referral link under the referral tab in your account.